Takeshi went to a private school called Jiyunomori Junior High and High School, located in Saitama, Japan. There he met Norio Fujimura, a mathematician and magic inventor, who had a significant influence on Takeshi. Takeshi then went on to study magic himself by reading books and watching videos on magic. He also found his love for music while in high school, where he enjoyed playing in bands, singing in choral and acappella groups. As a member of an acappella group, "WHO'S," he had performed throughout Tokyo, and had successful street performances in California in 1997. After graduating from Jiyunomori High School, Takeshi studied music and education at University of Nevada, where he studied jazz piano with Dr. David Ake. In 2001, he became an employee at NPO Free School Satoporo and helped its students with their problems through music. He was also a member of Alef; PIRKAMUSIC, and was greatly influenced by another member there, Masaharu Ida, a producer and bassist. Takeshi played the keyboard, accordion, and also performed magic in "PALOSIKS," the house band at a regional beer restaurant called "Otaru Soko No.1." The band performed more than 3,000 times in mere 4 years, and through these performances, Takeshi encountered many different styles of music and rhythms such as middle age music, tribal music, jazz, tango, traditional music from all over the world, and original music by Palosiks, all of which stimulated Takeshi's musical style. Besides Palosiks, he was involved in production of sound environment and composition/arrangement for commercials. Around this time, he also formed and performed with musical groups, "2 thumb' zapp" and "Nomade." Takeshi has turned freelance in the winter of 2005. He now mainly performs music and magic at educational and welfare institutions, bars, clubs, and children's theaters. 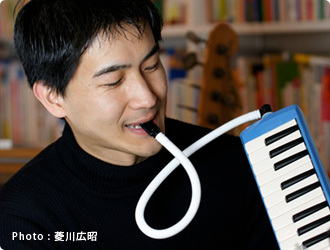 Takeshi aims to perform music and magic that will inspire people's imagination. In summer 2007, an eye-opening session with Hirotaka Nakagawa resulted in the formation of a new group: "ON'S," in which Takeshi plays regularly. Besides ON'S, Takeshi currently performs with Keropons, Sizzle Otaka, Yoshifumi Hasegawa. He also plays the keyboard and sings backup vocals for "Eadogube."